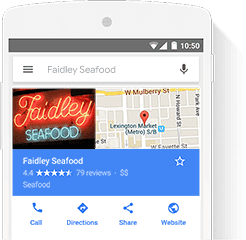 Show your open hours, phone number, and directions on Google Search and Maps — with Google My Business. Free phone support for customers committing to $10 per day or more in ad budget. Phone support operating hours are Mon–Fri, 9am–9pm ET. Standard data rates may apply. Show your products to interested shoppers, as they search on Google. Make recruiting easier. Hire works seamlessly with G Suite’s Calendar and Gmail to schedule interviews quickly and keep candidate communications in one place. See how your site, apps, and ads are performing. Then do more with insights from Google. Measure the end-to-end value of your app. See how your site scores on mobile-friendliness and speed. Learn how to put Google research and insight behind your thinking.